When, in 2010, the German chancellor Angela Merkel dismissed the “multicultural approach” as an “absolute failure”, and the Bavarian minister-president Horst Seehofer insisted that the “integration” of immigrants could only be achieved if they complied with “our German Leitkultur” they both reiterated the essentialist reifications of a ‘national identity’ characterising the public and political discourses of many European nation-states. There indeed appears to be a growing consensus that the representatives of ‘other cultures’ living in Europe not only should conform to the laws of the State but also subscribe – at least in the public sphere – to those representations that identify the society in question as a “community of values”. The culturally specifi c actions and values of immigrants might be tolerated in the private domain, provided they do not confl ict with the values of the nation-state in question. A similar consensus seems to prevail at the level of the European Union. The Preamble of the Treaty on European Union of 2008 propagated the idea that its member States share a “common destiny”, originating in the “cultural, religious and humanist inheritance of Europe“, and therefore constitute a common “community of values”4 as well. These orientations are evidently grounded in European paradigms of world history and philosophy. They draw on ideas deriving inter alia from Enlightenment, Christian morality and political secularism that are assigned a universal relevance. They inform many of the international legal and political discourses and their global advocacy is deemed a solemn task. And yet, it is part of the same value confi gurations to advocate the incorporation of ‘strange’ non-European representations into the personal repertoire of each individual citizen. Originating in Renaissance and Romanticist thought, and transmitted through ‘classical’ education, the idea pertains that the ‘oriental’ other may be valued as a source of metaphysical wisdom, moral purity,artistic originality and proximity to Nature. A peculiar configuration thus appears to characterise the valuation of people, ideas and actions of ‘strange’ provenance. What is excluded at the level of the nation-state should be included at the level of the individual’s life experience. 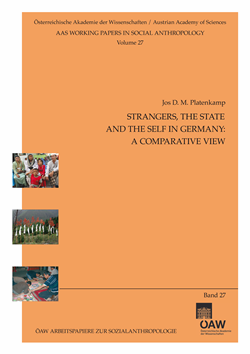 As far as this valuation of ‘strangers’ is concerned a curious gap opens up between the nation-state and the individual Self. To examine such value confi gurations let us recall Salman Rushdie’s words that “the only one who sees the whole picture […] is the one who steps out of the frame”. A “view from afar” is needed, and social anthropology is the social science par excellence to provide such a perspective. For only when observed through the lenses of other societies may one perceive the cultural idiosyncrasy of our own ideas and values more sharply. So let me therefore turn to some Southeast Asian societies first, and see how they value the presence of ‘strangers’ in their midst.